Just as we go out in the Spring to view the blossom – an important activity in east Asian countries – so we go out in the autumn/fall for a spot of leaf peeping: the informal English term now widely used for viewing of autumn colours in foliage. In Japanese, it is known more succinctly as momijigari 紅葉狩, which literally means hunting red leaves, or kōyō 紅葉 (autumn colours), or in Hokkaidō it may be termed kanpūkai 観楓会 (getting together to view the leaves). If you live in the US, there are websites which inform you when the change has occurred in more popular locations: Foliage Network, and Leaf Peepers, for example. The rise of landscape painting in the nineteenth century, and the introduction of higher chroma and more lightfast pigments, has made autumnal foliage a popular part of many landscape paintings. Here is a selection of some of my favourites. Samuel Palmer (1805-1881), The Weald of Kent (c 1833-4), watercolour and body-colour, 18.7 x 27.1 cm, Yale Center for British Art, New Haven, CT. Wikimedia Commons. 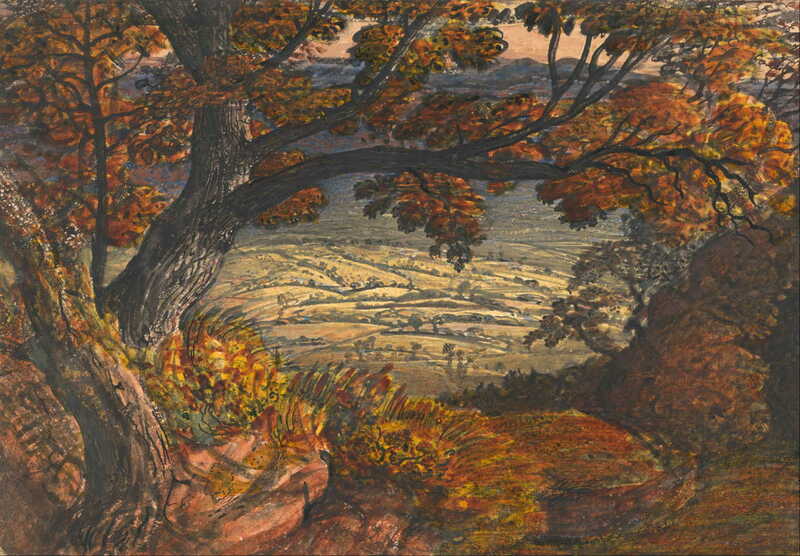 Many of Samuel Palmer’s views over the rolling countryside of Kent, in the south-east of England, feature brown leaves and golden fields, to the point where these watercolours are instantly recognisable. 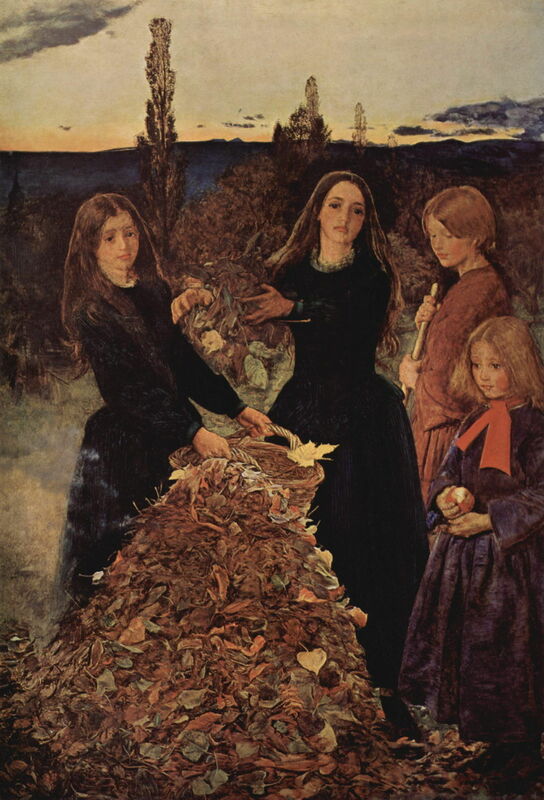 Another well-known image of autumn is John Everett Millais’ Autumn Leaves (1856), in which these children have been gathering the leaf fall for a bonfire. His foliage browns are the earths seen at dusk, though, rather than the dazzling reds and oranges of full sunlight. George Inness (1825-1894), Across the Hudson Valley in the Foothills of the Catskills (1868), oil on canvas, 38.1 x 66 cm, location not known. Wikimedia Commons. 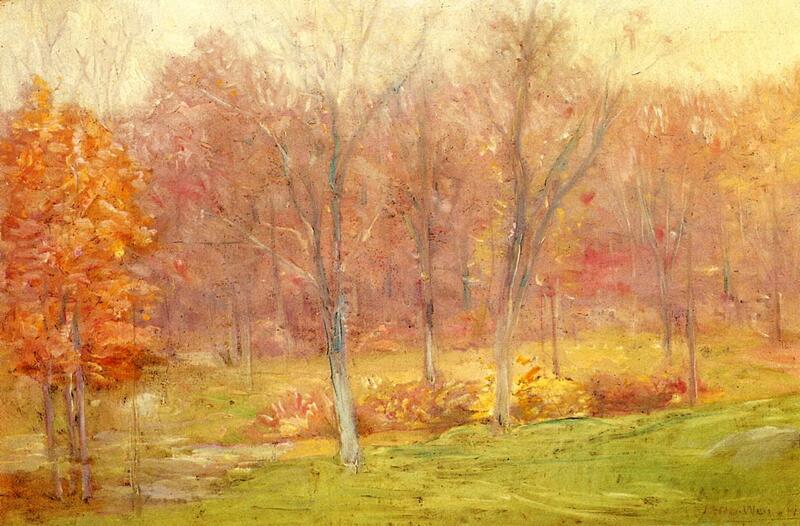 Several of George Inness’s views of the Catskills were painted in the fall. 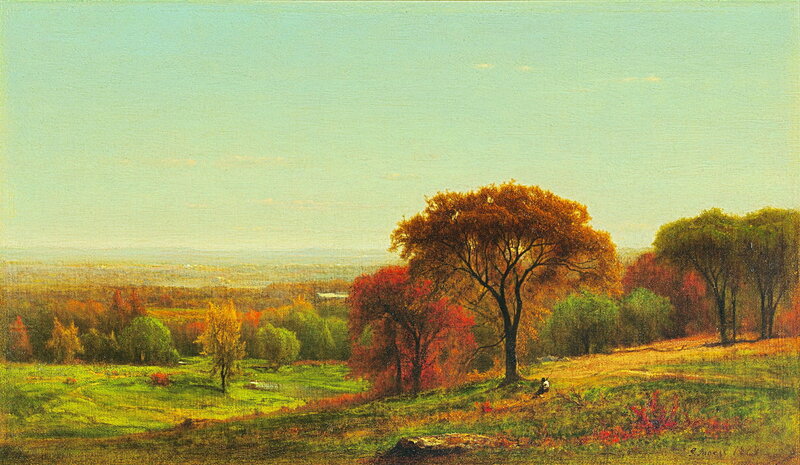 This view Across the Hudson Valley in the Foothills of the Catskills (1868) is my favourite for his perfect timing, in catching a mixture of different colours, from just the right location to show the contrast between those trees which seem to have burst into flame, and those still left in summer’s green. Claude Monet (1840-1926), Autumn on the Seine, Argenteuil (1873), oil on canvas, 54.3 × 73.3 cm, High Museum of Art, Atlanta, GA. Wikimedia Commons. 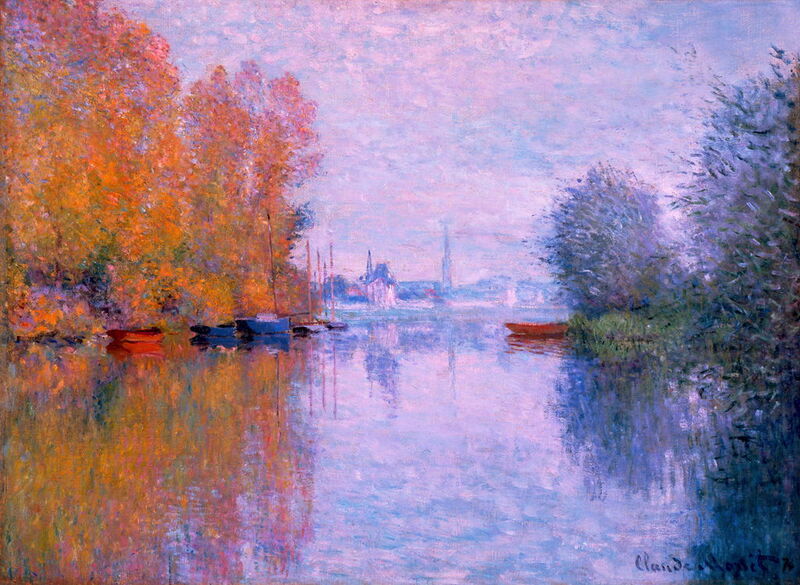 This is a contrast made so well in Monet’s famous Autumn on the Seine, Argenteuil (1873). Winslow Homer (1836-1910), Autumn (1877), oil on canvas, 97.1 x 58.9 cm, The National Gallery of Art, Washington, DC. Wikimedia Commons. Winslow Homer also made full use of autumn colours. 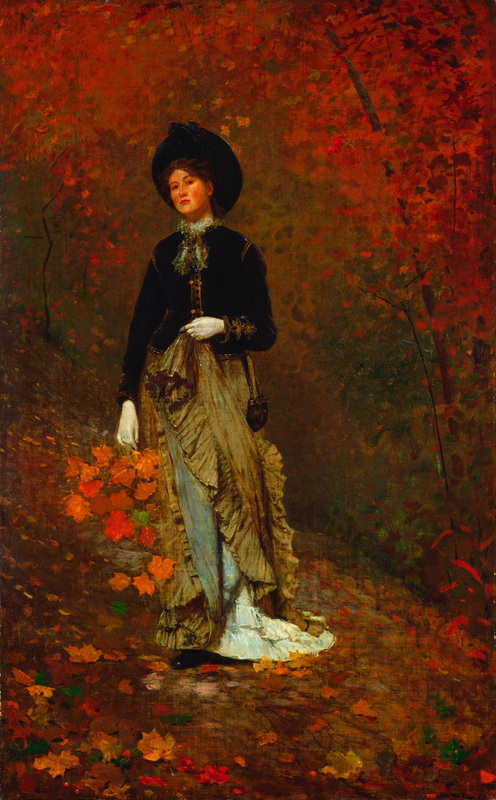 Although this painting of Autumn (1877) was made before he stayed at Cullercoats in north-east England, to my eye it is one of the best works of his early career. Marie Bashkirtseff (1858–1884), Autumn (1883), oil on canvas, dimensions not known, State Russian Museum, Saint Petersburg. The Athenaeum. Marie Bashkirtseff, protégé of Jules Bastien-Lepage, matches the duller browns of her leaves with the muddy tracks in one of the parks beside the River Seine in Paris. Julian Alden Weir (1852-1919), Autumn Rain (1890), oil on canvas, 40.64 x 61.6 cm, Private collection. WikiArt. 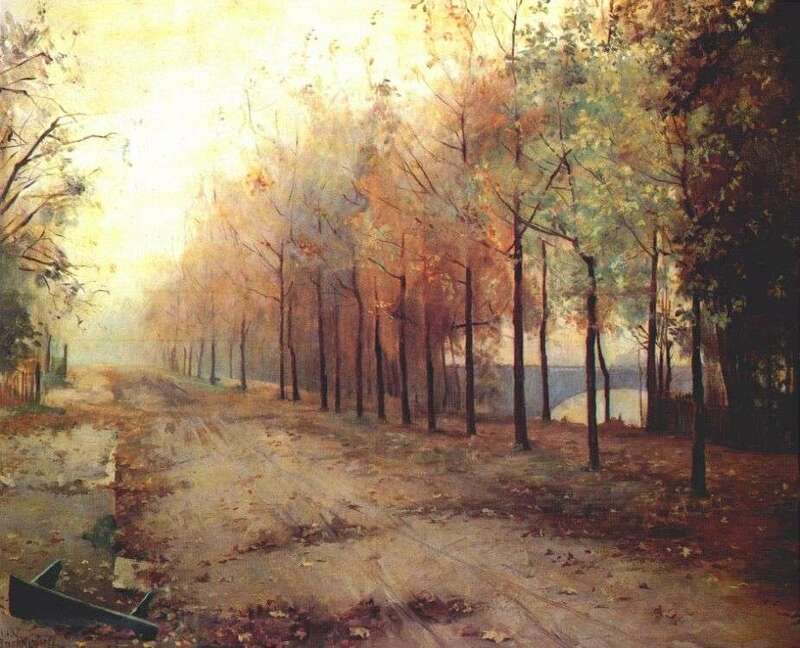 when the light is sufficiently strong, rain without fog can also have the effect of enhancing the chroma, as shown in Julian Alden Weir’s Autumn Rain (1890). 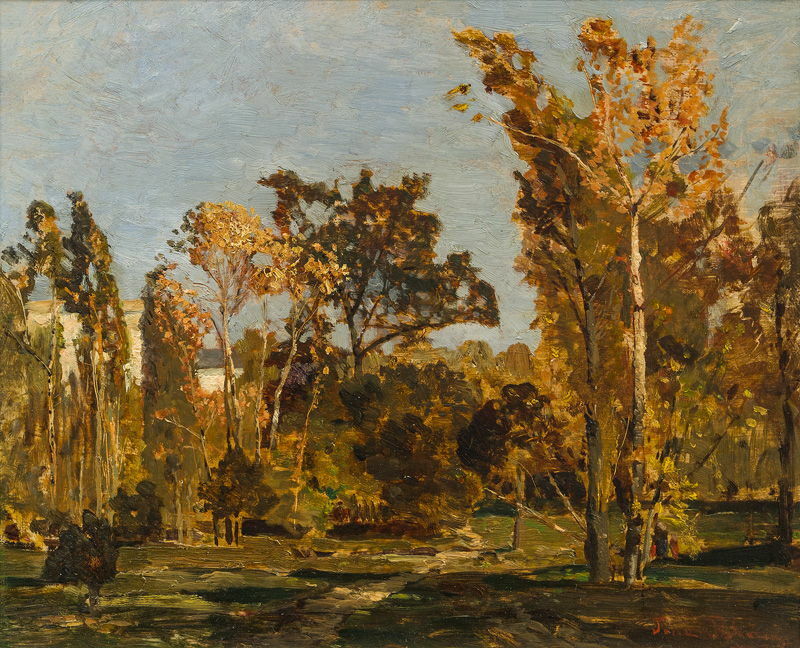 The Austrian Post-Impressionist landscape painter Tina Blau painted her favourite park, Vienna’s Prater Gardens, as its trees were just starting to change colour one autumn. Claude Monet (1840-1926), The Three Trees, Autumn (1891) W1308, oil on canvas, 92 x 73 cm, Private collection. WikiArt. 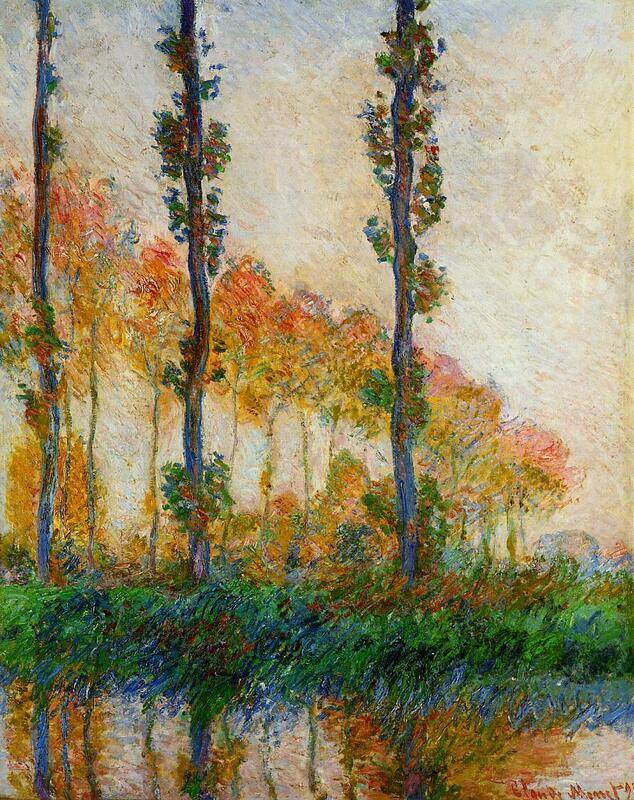 Several of Monet’s series of paintings include the colours of autumn – here, the distinctive poplars sweeping alongside the River Epte, a few kilometers from his home at Giverny. 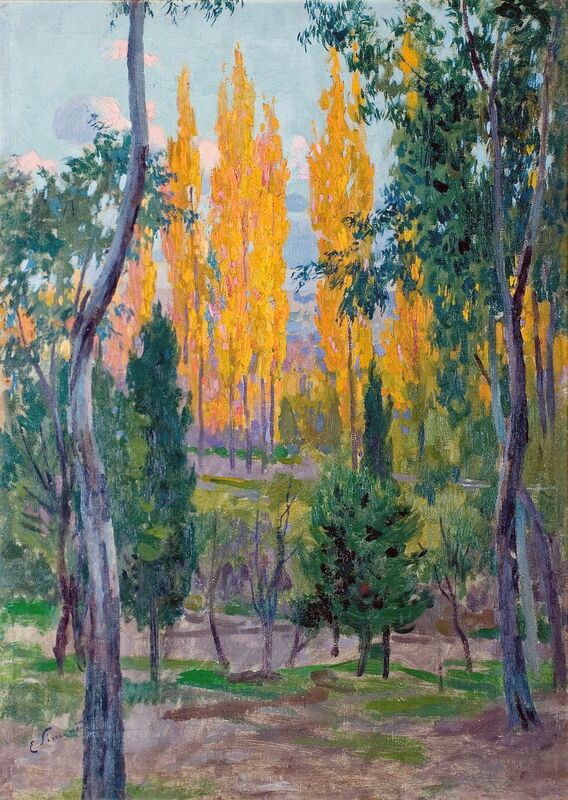 Camille Pissarro’s take on poplars at this time of year is less memorable, but more characteristic, perhaps. This is one of the hundreds of works which form his huge series painted around his home at Éragny-sur-Epte, near the same river featured in Monet’s poplar series. 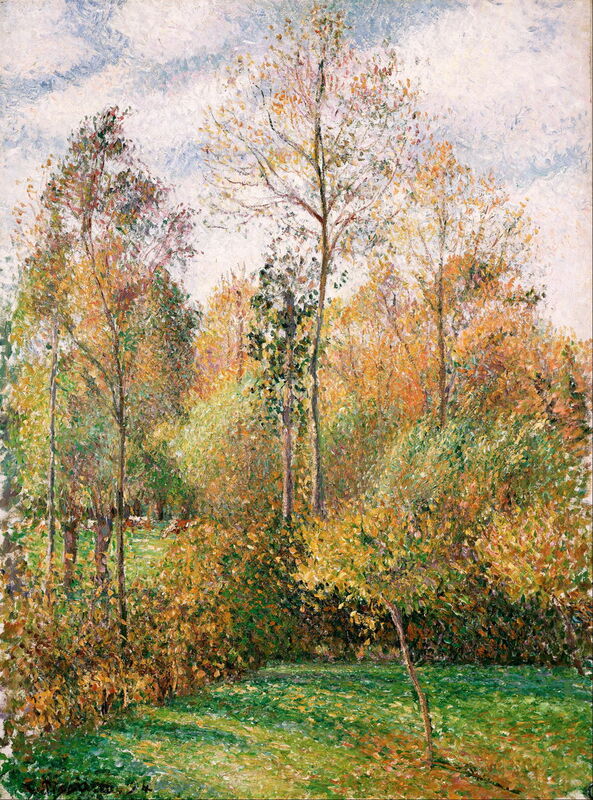 Although by this time, Pissarro’s brief period of Divisionism was finished, its influence lives on in his fine patches of colour. Adrian Stokes and his artist wife Marianne (who was Austrian by birth) travelled widely in Europe. 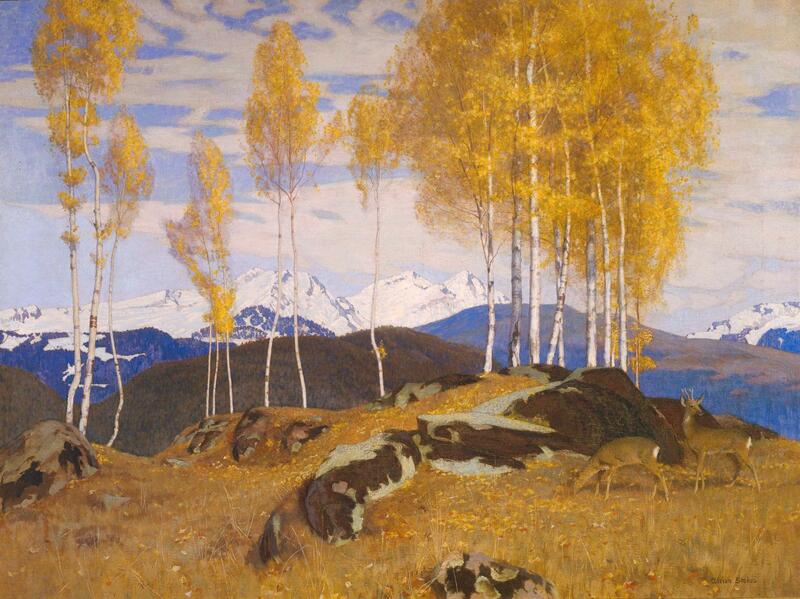 Autumn in the Mountains (1903) shows young birch trees in their more subtle autumn colours, probably in the European Alps. In the US, during the early years of the twentieth century, Post-Impressionism was transforming into Modernism. 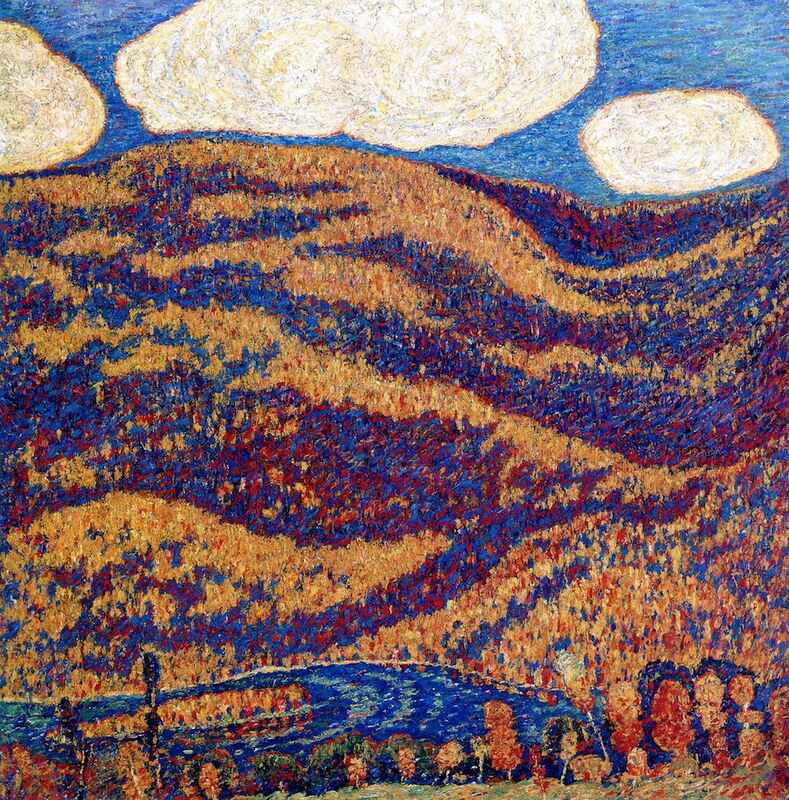 Marsden Hartley’s Carnival of Autumn (1908) is an early example of that transition, with its brash colours and almost Divisionist technique. 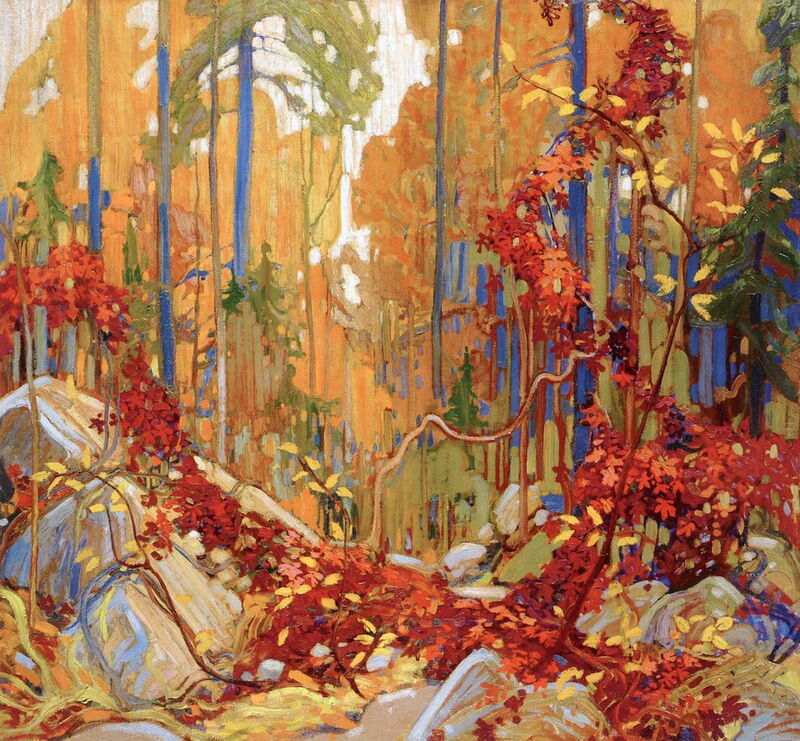 The Canadian Tom Thomson’s plein air landscape paintings are true impressions of often transient conditions, and were frequently made in the autumn, to capture its colours. Some, such as Autumn’s Garland (1915-16), were painted in the studio during the following winter, from those sketches in front of the motif. 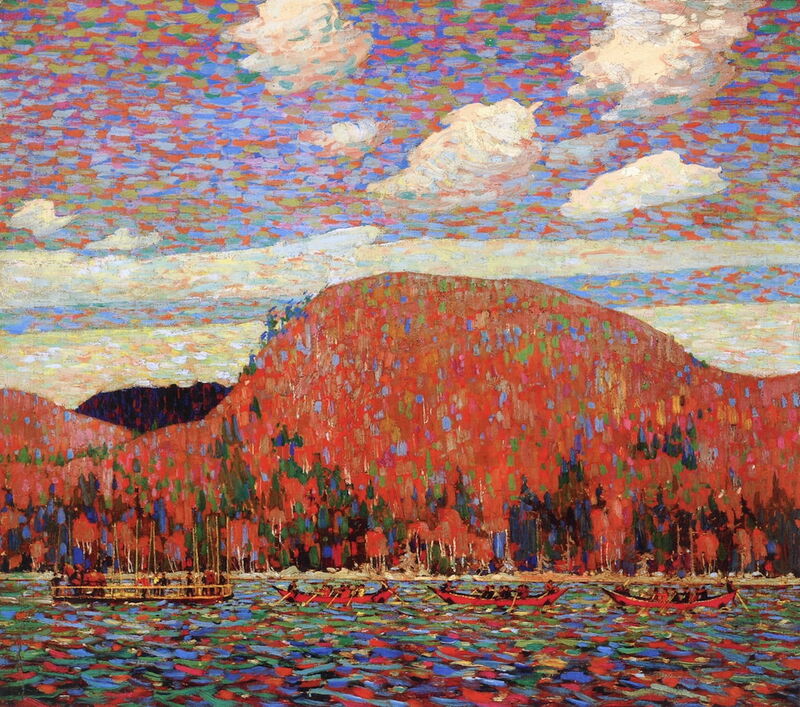 Painted in the studio during the winter before Thomson’s tragic accidental death, The Pointers (1916-17) refers to the loggers’ ‘pointer’ boats shown crossing this lake. Strangely, Thomson does not appear to have based this on a previous plein air sketch. More traditional styles of landscape painting survived both the rush to Modernism and the carnage of the First World War. This canvas by the Spanish artist Enrique Simonet shows a very Spanish motif: the Dehesa. This is a type of landscape characteristic of southern and central Spain and Portugal (where it is known as montado). The Dehesa is a traditional mixed, multifunctional environment providing grazing for cattle, goats, sheep and pigs, mixed trees centred on oaks, and support for many endangered species such as the Iberian lynx and Spanish imperial eagle. 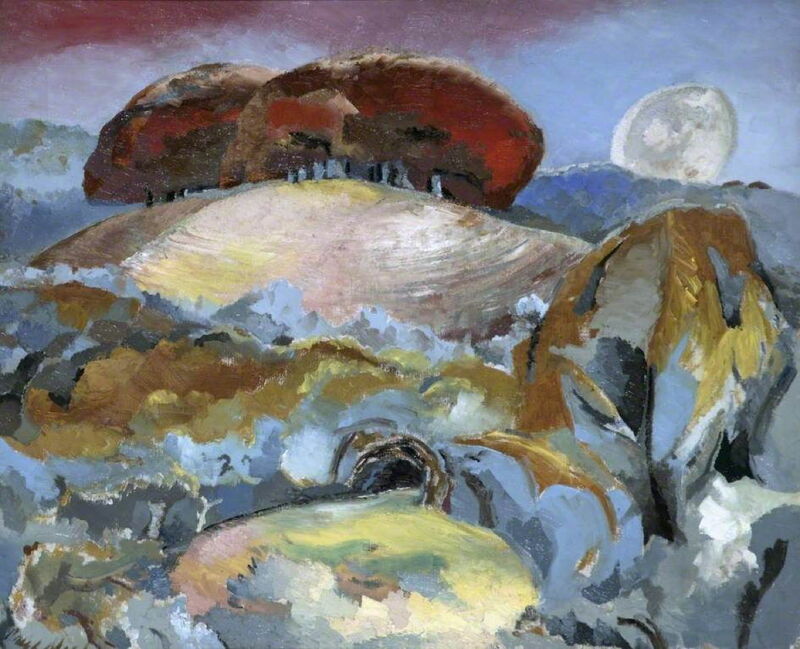 Finally, from the end of the Second World War in Europe, is Paul Nash’s surrealist Landscape of the Moon’s Last Phase (1944), one of a series exploring the phases of the moon. Prominent in his composition are the trees of an Iron Age hill fort, one of the Wittenham Clumps, on the border of Berkshire and Oxfordshire, England. When Nash had first seen these, he described them as “a beautiful legendary country haunted by old gods long forgotten”. In the classical pantheon, the autumn/fall lacked a significant deity, but I think that Nash and the other artists have come close to depicting its earthly form. Posted in General, Life, Painting and tagged Bashkirtseff, Blau, Hartley, Homer, Inness, Millais, Monet, Nash, painting, Palmer, Pissarro, season, Simonet, Stokes, Thomson, Weir. Bookmark the permalink. What a splendid collection of pictures! And that Homer is one of my favorite paintings. Lots of new-to-me things to see. I’m happy.